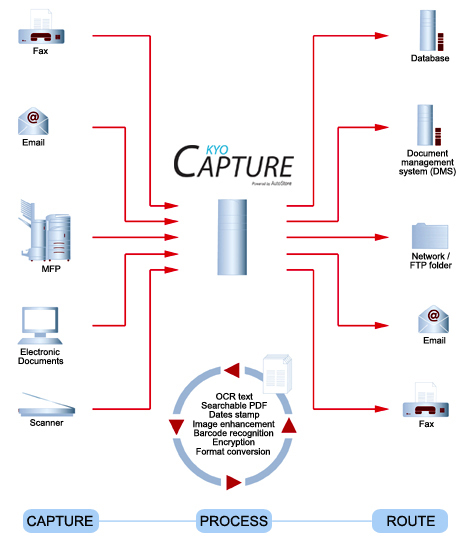 KYOcapture Express: KYOcapture Express is a simplified document capture workflow solution designed for small to medium sized business which integrates with select Kyocera MFPs allowing users to capture documents, index & OCR for full text search capabilities directly from the MFP. KYOcapture Workflow: KYOcapture is a comprehensive document capture workflow solution designed to satisfy more complex document capture needs. It integrates with select Kyocera MFPs allowing users to capture documents, index, directly from the MFP. A variety of processing and routing options are available, connecting major document management systems such as IBM Content Manager and Interwoven NT/MP. A 30 day trial is available for download from www.kyosolutions.com. For more information, please contact Athens Digital Systems or send an e-mail to info@athensdigitalsystems.com.